QuietEar Ear Plugs from HearTech offer variable noise reduction (VNR) technology, letting you hear what you need to hear (voices and other sounds in the voice frequency range) while protecting you from dangerous higher frequencies, and providing increased attenuation as the noise volume at the ear increases. QuietEar earplugs have a built-in acoustic filter in the form of a precisely designed vent. As the volume of noise increases at the ear, QuietEar automatically provides increased attenuation, resulting in higher noise protection at higher noise levels. This means at lower noise levels, you can easily hear voices without having to remove your earplugs. In addition, QuietEar offers differential noise attenuation at high and low frequencies, which means sounds in the range of the human voice are always attenuated less than the higher, more dangerous, frequencies. The vent also means QuietEar is more comfortable for extended wear, allowing your ears to breathe and reducing the "plugged-up" feeling common with many solid earplugs. Made of durable and washable pre-molded silicone, QuietEar plugs last for months or even years as long as they are cleaned with mild soap and water after each use. Tested according to U.S. Standards ANSI S12.6 - 1997. Sold in individual carrying cases, in quantities of 1 pair, 3 pairs, and 40 pair group pack. QuietEar Reusable Musician and Motorcycle Ear Plugs5MarkNovember 27, 2018These work really well. Pressure changes don't hurt. I can talk to and hear folks fine...--I just don't notice the wind noise hurting like it did. works! QuietEar Reusable Musician and Motorcycle Ear Plugs4MikeSeptember 29, 2017Bought these for long trips on my motorcycle to cut down on noise from the wind. They work great, but also make it hard to hear people when I'm not moving. That said, I will keep using them. QuietEar Reusable Musician and Motorcycle Ear Plugs5CarlJune 3, 2017These ear plugs are comfortable durable and work as advertised. The painfully loud alarm noises at work don't hurt with these in, but I can still hear well enough to have a conversation, even talk on the phone. Unless your ear canal is tiny, don't get the small. QuietEar Reusable Musician and Motorcycle Ear Plugs3IGJuly 14, 2015These are the best feeling/fitting ear plug that I have used. ?house brand from an oem? I do notice, however, that with an HJC ZR1 helmet fitted with a neck wind screen, there was some serious amplification somewhere in the mid range. (I presume from a standing wave problem.) Therefore I cannot use them for this primary purpose. I haven't checked if loud music gives the same effect. My favorite motorcycle plugs so far are the Vater with the green filters. If I need to hear more, the Mack's "New High Fidelity" for 12 NRR are great with a very low profile. The very low profile of the Macks are also great for the club. However, QuietEar plugs are so cheap, I suggest just adding a pair your order to give them a try. They might work for your anatomy better. I definitely love their feel. QuietEar Reusable Musician and Motorcycle Ear Plugs5sj...nyOctober 30, 2014Bought these and the silent ones for my son who developed a hearing sensitivity about a year ago. He can't go to movies anymore, school functions and assemblies where a sound system is used or a DJ. We tried a few earplugs but he never liked the comfort. Was hoping these would be our answer but they didn't fit well. Maybe he's picky but his band teacher gave him these little yellow ones by EAR classic and he seems ok with those. QuietEar Reusable Musician and Motorcycle Ear Plugs5CarlMay 27, 2014I work in a hospital, and have to talk to and hear people talking to me all day long. The hospital has purchased new beds that have alarms that can be set to go off when unsteady patients try to get up without help. It happens a lot. The sound is painful like a smoke detector. To deactivate, you have to get very close. The ear plugs prevent the pain, and still allow for conversation. They are now part of my uniform. QuietEar Reusable Musician and Motorcycle Ear Plugs5AngieMDecember 1, 2013I have a neighbor across the street that purposely turns up the volume on his bass speakers to annoy me day and night. He purposely has the speaker angled in a way that I can hear the bass coming from the woofers, etc. and no one else in the neighborhood can hear it. Thank goodness for the QuietEar ear plugs. They actually help filter out the horrible bass noise and my ears aren't hurting anymore. I wear these during the day so I can still hear other sounds. QuietEar Reusable Musician and Motorcycle Ear Plugs5DickSeptember 23, 2013got 2 pair of these .. look just like the picture...save you money.. they do not stay in your ear. tried and tried...no stay..not worth thing about..
QuietEar Reusable Musician and Motorcycle Ear Plugs2AJAugust 8, 2013I race a sports car and sometimes work in the pits. These did little to control the noise. Worth a try for the price, but I'll stick to the tried and true disposable foam ones. QuietEar Reusable Musician and Motorcycle Ear Plugs5PeteJune 15, 2012First the service of the Earplug SuperStore was excellent. They had the products in stock and shipped very quickly. I found the QuietEar plugs in size small fit me well and block just about the right amount of sounds while riding my sport bike. I also tried the SilentEar plugs but those seemed to block too much road noise in my opinion. QuietEar Reusable Musician and Motorcycle Ear Plugs4WhiteHelmetGuyMay 22, 2012I really like these plugs. I wear them with a quality full face helmet, and the level of sound deadening they do is just about right for me. If you wore them with a shorty helmet with your ears not well covered, they might be inadequate. For those folks, I would recommend the QuietEars model that are a step up from these in terms of isolation. QuietEar Reusable Musician and Motorcycle Ear Plugs3RobertMay 8, 2012These ear plugs are nice, but don't have the decibel reduction of the plugs that don't breathe. I would say if you were behind a tall windshield on a motorcycle they would be great, but out in the wind, helmet noise would be excessive using these. That is my experience. QuietEar Reusable Musician and Motorcycle Ear Plugs2JimMarch 27, 2012Disappointed these did not fit. Chose the middle size and they were too big or did not fit properly- fell out. I use other plugs with no problem but wanted less attenuation so I tried these. Guess you need to know your size! QuietEar Reusable Musician and Motorcycle Ear Plugs2heatherDecember 3, 2011I wouldn't recommend this for motorcycle riding. I am a female that wears size small Scorpion EXO1000 helmet. 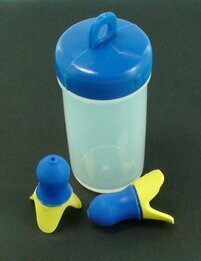 The plugs gets pressed down by the pads and creates pressure against the ear canal walls. The plugs are bit tough to insert since you can't press it in due to the tiny air hole. My engine noise sounded lounder because the vibrations resonated and was trapped by the earplugs. At the end of my ride I had a constant buzz until I removed the plugs. You're better off using one of those hi fi plugs. I use Etymotics though it still gives me a buzz at the end but not quite as bad and the engine noise, vibrations, and resonance is eliminated. QuietEar Reusable Musician and Motorcycle Ear Plugs5RobertNovember 17, 2011I've been using these on my motorcycle for a couple of years now, and they are great. The variable attenuation reduces the painful noises while allowing you to hear sounds you need to know about for safety. I suggest cleaning them with soap, water, and rubbing alcohol every week or two. QuietEar Reusable Musician and Motorcycle Ear Plugs4CarolJune 30, 2011Works perfect for minimizing the drums/electric guitars used in our worship service. Still able to hear perfectly with no ear pain (I like the music, but not the piercing loudness of the music/instruments). QuietEar Reusable Musician and Motorcycle Ear Plugs2TimJune 4, 2011Purchased the trial pack of 2 sizes to ensure proper fit. Fit was ok. I work in manufacturing company that allows its Mexican employees to listen to radios blasting mexican music. These plugs were an attempt to reduce the impact on me. Unfortunately they did little to nothing in reducing the noise level. Will try something else. Was a disappointing result. QuietEar Reusable Musician and Motorcycle Ear Plugs2JerryMay 23, 2011I really liked these earplugs for awhile but the band got louder so these plugs are not working for me anymore. They cut the highs quite well, but as I said in my previous post, they do allow a lot of sound through so it really depends on how loud your band plays. I switched to the ER20's. QuietEar Reusable Musician and Motorcycle Ear Plugs2MattMay 1, 2011These ear plugs are soft, easy to clean, and made of durable silicone but they just don't stay in my ears. About every 10 minutes of riding on my motorcycle I have to push them back into my ears. Even when they are in my ears tightly they don't block nearly enough of the noise that comes off my bike. Overall very dissatisfied. QuietEar Reusable Musician and Motorcycle Ear Plugs2RobApril 29, 2011I use these for motorcycle riding, and they don't offer quite enough protection. They would probably be good for around town, but even 20 minutes on the highway shows them lacking. QuietEar Reusable Musician and Motorcycle Ear Plugs5JerryMarch 28, 2011As a musician who plays in a rock band, I have tried quite a few earplug brands and I really like these. They do not provide as much attenuation as the others but that's exactly why I like them. I do not feel isolated as I can hear everything except the really high shrill stuff. They work for me but everyone is different so try a few brands out and you'll find your favorite. This one is mine. Thank you Ear Plug Superstore! QuietEar Reusable Musician and Motorcycle Ear Plugs5BruceDecember 29, 2010I like these ear plugs. I ride a Harley Ultra, and the foam plugs block out too much sound, so I can't hear traffic around me well and I can't enjoy the bike's sound system. These plugs block enough sound to protect my hearing, but allow enough in to be safe on my rides and enjoy my tunes. Foam ones are great at night for my snoring wife, but not good on a bike. QuietEar Reusable Musician and Motorcycle Ear Plugs5PatrickNovember 16, 2010I know I'm the odd man out; however, i didn't care for these. I bought the 3 pack with different sizes and none of the sizes fit well (didn't block out sound). I'm sticking with foam until I can get a custom pair.